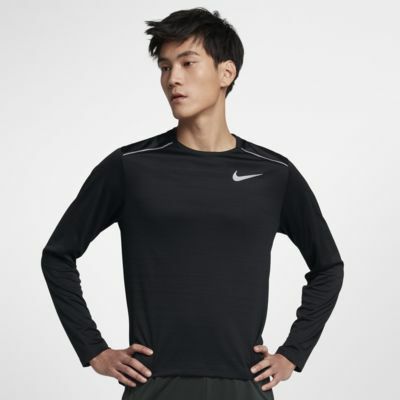 Layer up in the Nike Dri-FIT Miler Men's Long-Sleeve Running Top. Sweat-wicking, breathable coverage helps you stay comfortable, while the back mesh panel provides targeted ventilation. Layer up in the Nike Dri-FIT Miler Men&apos;s Long-Sleeve Running Top. Sweat-wicking, breathable coverage helps you stay comfortable, while the back mesh panel provides targeted ventilation. Updated crew neck has a minimal design and smooth feel.